iOS is very rich of exclusive apps and games or at least iOS is the first to receive apps in most cases. Even Google, the internet and smartphone behemoth, which has Android under its belt, releases features first for iOS and then for its own child, Android. 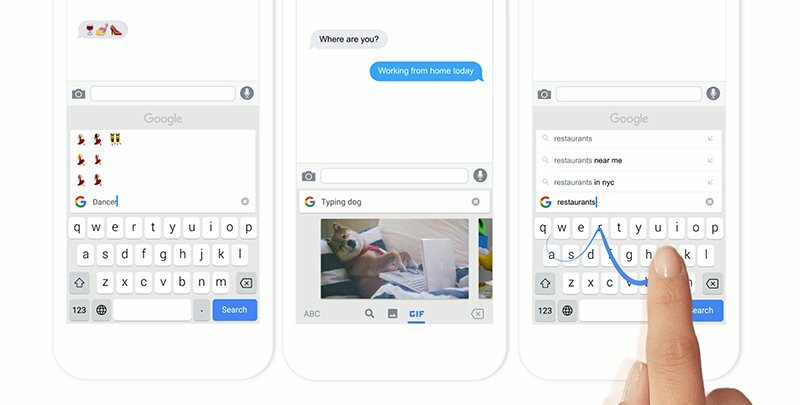 For example, earlier this year, Google released ‘Gboard’, a keyboard app for the iPhone. “Gboard”, unlike the normal keyboards, sports a search section right under the keyboard’s wing. It’s an intelligent way to incorporate search in the keyboard. I hadn’t used it till today, as I use an Android phone, however, I had looked at the videos, and I was pretty impressed by the way it works. Earlier today, Android Police reported that Google is about to release the “Gboard” functionality on the Android platform; almost after six months since the release of the app on the iPhone. However, even before the official release of the app on the Play Store, apkmirror (the site, apkmirror.com) managed to get its hands on the APK. I downloaded the APK, and it works perfectly. The “Gboard” keyboard is identical to the Google Keyboard, however, there is a circular Google icon on top-left of the keyboard, which when touched hides the keys and displays a search bar in place of the keys. I find it very interesting and helpful. It lets me get quick info without leaving my chat or when I am in different apps. However, it’s not like a full fledged search app in the keyboard, it will show just a little information. I don’t have any problem with that and I think that’s actually better than showing a full search results. Google wants smartphone users to be able to quickly search, for things like, meaning of a word when you are chatting or info about a movie which your friend suggested. It’s great to finally see all that on Android. Not yet officially though. Happy chatting, my friends!